The history of the Barcelona Chair. A royal chair. The Barcelona chair was exclusively designed for the Barcelona Pavilion for the International Exposition in 1929, which was organised in Barcelona, Spain. 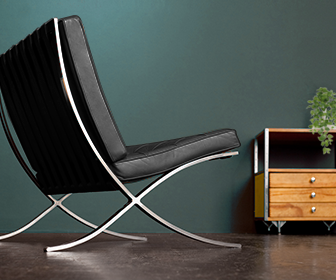 The designer of the chair is architect Ludwig Mies van der Rohe and his partner, interior designer Lilly Reich. A lot depended on Mies van der Rohe. He had to design a very special chair, a chair that symbolized the German culture and emphasized their creative performances and economic viability. The Commissioner, Georg von Schnitzler, said that the building should give voice to the spirit of a new era. Even though most architects and designers from the Bauhaus era wanted to design and provide houses and furniture for the average person, the Barcelona Chair was an exception. At the International Expisition there were two white Barcelona chair sets shown, both made with goat leather. The chair was designed as lounge chair for the Spanish King Alfonso XIII and Queen eugine Victoria, to watch the opening ceremony of the exposition. The shape of the legs were inspired by the Roman folding chairs, which are also known as Curule chairs, which were used by Roman aristocrats. These folding chairs were a real status symbol back then. Even though the Barcelona Chair has a industrial feel to it, it requires a lot of manual work to be made. The Barcelona Chair fits surprisingly well in the modern surroundings of the Pavilion which was mainly made of a lot of glass and four different types of marble. The visitors of the exposition must have felt like they were in a real futuristic and modern setting. There is a story going around that the royal visitors of the International Exposition didn’t even use the chairs, but the Barcelona Chair quickly got the reputation that it’s of royal quality. In 1950 Mies van der Rohe redesigned the Barcelona Chair, so he could use stainless steel, a material that was completely new back then. The fact that the frame is now made of stainless steel also meant that the legs could be made of one solid piece of metal. Mies van der Rohe was a Bauhaus designer, someone who believed in producing functional furniture which was ready for mass production. The weird thing about this is that the Barcelona chair is completely unfit for mass production right now and an authentic version of the chair is very expensive. In 1953, six years after Mies van der Rohe’s partner Reich passed away, the company Knoll Inc. started with the production of the Barcelona Chair. The frame is available in chrome and stainless steel and the cushions are available in different colors and leather types. More than eighty years after the introduction, the timeless design of the Barcelona chair is still very popular and it still hasn’t lost its charm. These days there are also many high quality replica versions of the Barcelona chair available.